The last Grand Slam of a very long season – due to the extra excitement of Olympic tennis – leaves us feeling bittersweet to say the least. The retirement of Kim Clijsters and Andy Roddick will certainly give us less to dish about when it comes to tennis fashion. And there are other reasons we will miss these two memorable phenoms. In addition to the Aussies, Americans too have adopted “our Kim” as one of our own – we have enjoyed her winning personality and amazing on-court flexibility. And Mister Roddick? Well, in spite of ourselves sometimes, we enjoy his feisty attitude and sharp wit, not to mention that serve…we will miss that serve! In one corner…Tobias Kamke of Germany. 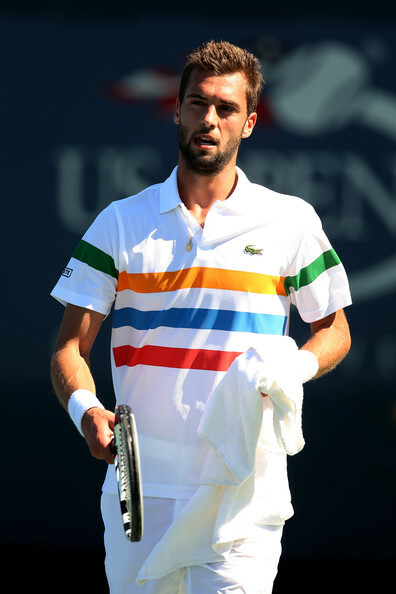 In the other…Benoit Paire of France. 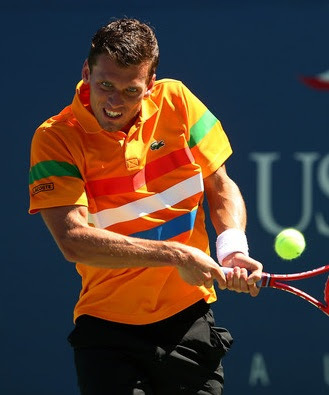 While we admire the design and lined detail on both shirts, we prefer the contrast of the bright orange against the black pants – the WINNER…Herr Kamke (check out Tobias' style in Lacoste fashion for U.S. Open post!! While it may be hard to believe, it appears that both Venus and Serena (at the same time, in the same tournament) have gotten the memo...finally! The sisters looked TERRIFIC at this year’s open, although we are singling out Serena here. While her doubles (left) AND singles (right) outfits appear trendy, bright and comfortable – the WINNER is the SINGLES style, due to its flattering vertical lines. Also, the sleeveless look better features her trimmed down, well-defined guns! Lastly we have two of our favorite tennis fashion plates: Maria Kirilenko and Anna Ivanovic in a battle of the “classics.” Both girls sport simple yet very pretty tennis dresses paired with bright white visors, shoes and wristbands (check out their styles in the post dedicated to Adidas fashion at U.S. Open). Both are so fetching that we simply cannot choose a winner. 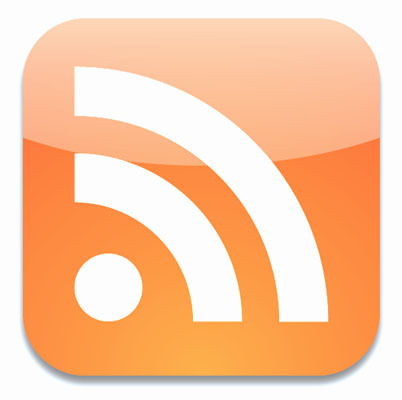 Our DECISION: It’s a draw! 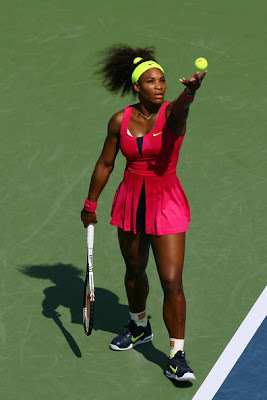 Check out our daily fashion reports from the U.S. Open and stay tun for our “Best Dressed” and “Worst Dressed” picks for the 2012 U. S. Open!